All right this is hard to type but I have to consider options if I want to continue kiting open water. I have a shoulder injury (inflamed Burcer, small tendon tear and some issue linked to bicep as well). Recently got a quarter zone injection and it was feeling ok for a few days. I will just get fat and die if im not kiting so extended rest or retirement not an option. Then i did my usual loose board in rip or outgoing tide and took me 20-30 minutes to body drag recover it, arm above head loading up was killing me with pain and reinjured problem, but i got the f'n board . How badly will i get teased if I get a go joe for the surf? Im a sensitive guy. Not keen on a leash but is there anything else I could look at doing to avoid this life of scorn and ridicule? I had the same.. Had a few of those injections too. They just mask the problem and it doesn't settle down. Get a spikey massage ball and get used to pain and roll it out and stretch it out in the pool I found works best with a kick board and flippers laying on your back and hands on the board not holding it. I wasted nearly two year's on injections and physio. They'll love you coming back. Then it'll settle down, cost me a lot in down time, pain and paying other people's rent for something that doesn't need surgery. The physio just kept making it flare up.. I had a similar injury. Tried slings, physio, balms and acupuncture. nothing worked for more than a few days, some only hours. Ended up with a referral for surgery and had the bone ground back. Lost 3mm of the rotator joint. 10 weeks off the water but Its been 5 years now and no return or pain at all. Might be worth investigating. I went to a new physio today and he did a strength test that none of the others did and I had nothing. Could hardly move a feather. He thinks it might requite surgery but suggested try and strengthen first. I get no gain in three weeks his pretty certain its a knife job. So ill run with that, he said a doctor will need mri to detect it so another 300 dollars. Gotta follow up or only kite surf shallow water. 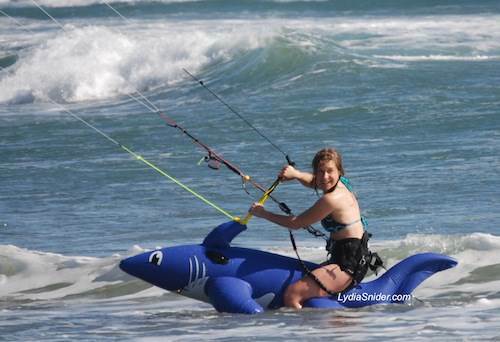 He said i shouldnt kitesurf, So maybe another opinion needed ?? You don't need to body drag with your arm above your head in both directions. Go hard nuts in the direction that you can well past the board. The cooze downwind back to the board on your bad side. Also don't fall off as much. Back off the silly until your arm is fixed. Find a location that doesn't have rips and wont mean extended body dragging. Look at the bar pressure of your kites. If too high look at light bar pressure kites. Lastly, embrace the embarrassment. Wear a tutu or gimp suit and mock yourself relentless while at the beach. Nobody at the beach will mock the crazy person punching themselves in the face! Although arm out in front extending your shape is more efficient, you can also put your arm down by your side (palms up, knife-like) to act like the bottom rail of your board and use that to give a higher upwind angle. You will need slightly more speed than normal and a little more lift (kite higher) so that your arm is doing relatively more work than the rest of you. If you've done bodysurfing before, going sideways on a wave to keep in the curl is almost the same technique.